To abolish the long-standing North Korean nuclear threat, President Trump met Kim Jong-un in the first U.S.–North Korean summit to establish a personal relationship and jump-start negotiations. However, President Trump has been no more successful than his predecessors. 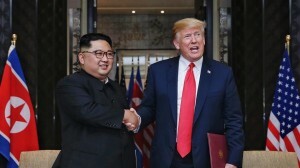 U.S. claims of success at the 2018 Singapore Summit were excessive and premature. There has been no tangible progress on North Korean denuclearization. Pyongyang continues its nuclear and missile programs unabated, and there has been no degradation of the multi-faceted North Korean threat to the United States and its allies. The U.S. is now risking a second summit with North Korea without first insisting on fleshing out the bare bones of the Singapore Summit statement. There are concerns in Washington, Seoul, and Tokyo that President Trump may agree to several North Korean proposals that appear beneficial but contain hidden perils. Much is riding on the outcome of the next Trump–Kim summit. The second summit must not repeat the mistakes of the first. It must have substance rather than simply the pomp and circumstance of the first. China Resists U.S. Efforts to Blacklist Ships Through U.N.